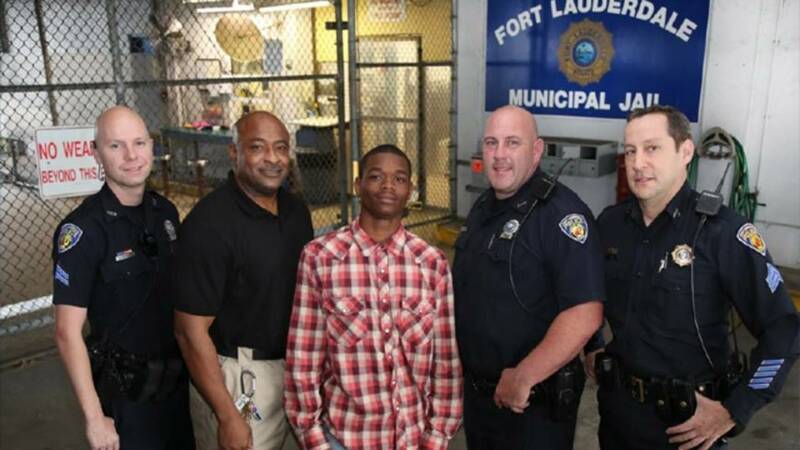 FORT LAUDERDALE, Fla. - A juvenile being booked for a crime is now being honored as a hero after helping save the life of a Fort Lauderdale police officer. On Sept. 10, 2014, Jamal Rutledge was being booked by officer Franklin Foulks for an unknown crime when Foulks suddenly collapsed. Using some quick thinking, Rutledge immediately began to kick a security fence to alert nearby officers of Foulks' condition. Sgt. Todd Bunin found Foulks lying on the ground in a semiconscious state while clenching his chest. Two other officers, Robert Norvis and Raymond Ketchmark, were called to the scene and immediately began performing CPR. Rescuers arrived and were able to transport Foulks to Broward Health Medical Center. The staff at Broward Health Medical Center noted that Rutledge's actions and the quick response of the other officers were largely responsible for saving Foulks' life. Rutledge and the officers will be publicly recognized for their life-saving efforts at a Fort Lauderdale commission meeting Jan. 21.